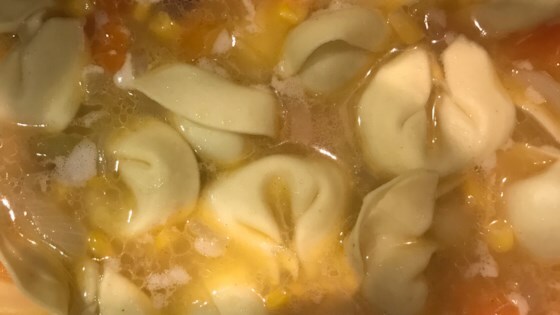 "I made this soup up one night, from whatever I had on hand! The result was so easy and so delicious!! It made me happy, thus the name!! Try it with garlic and crusty French bread, or even cheese bread!! Garnish with grated Romano cheese." In a large pot over medium high heat, bring the broth to a boil. Add the red pepper flakes and basil to taste, then add the tortellini and cook per package instructions, or until tender. Add the beans and cheese and reduce heat to medium. Simmer for 5 to 8 minutes, or until beans are tender. Add the corn and allow to heat through, about 1 to 2 minutes. This recipe is really easy and tastes great. Instead of tortellini I used Chicken/herb ravioli that I had in my freezer. The spices give it a little kick too. A keeper! This was OK, but it tasted to me like what it was - a bunch of different things dumped in a pot. The flavors didn't blend enough. This a very lovely soup. I always favor soups with pure, light flavor, especially when you have a sick hubby to take care of! The name of this recipe says it all.